London is a great jumping off point for exploring the United Kingdom, and is certainly where most travellers begin (often without heading out of the city at all). This is a list of the best towns, counties and villages to get you out of the city for a long weekend, and explore the history of England along the way. 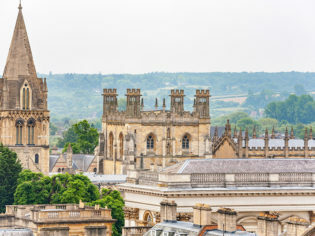 Oxford, dubbed ‘the city of dreaming spires’, has been home to the likes of J. R. R. Tolkien, Oscar Wilde and Emily Davison, all who attended the world famous Oxford University. If you visit however, you’ll be quick to learn it’s much more than a university town. The city boasts incredible architecture, history and food, with a trip promising romance, relaxation and a little bit of learning in the middle. Oxford lies approximately 90 kilometres north-east of London. The journey will take approximately one hour, by both train and car. Gail’s Bakery Jericho on Little Clarendon Street offers the best in baked goods. Stop in for a croissant/cinnamon bun hybrid, a serve of thick cut sourdough toast with home-made jam and clotted cream or a ham and gruyere cheese croissant. The eat-in dining experience offers quality service, or alternatively, grab it take-away and seat yourself in one of the many university gardens. For dinner, hit up the best restaurant in Oxford, the Oxford Kitchen, where you can enjoy rabbit croquette for starters, confit pork belly for main and finish it all off with a nectarine parfait. With exposed brick interiors, industrial meets chic in this acclaimed venue. Café Rouge is another great spot, particularly for a nice lunch in the courtyard on a sunny day. Grab a croque monsieur and a coffee, to hit the spot. Punting, usually whilst sipping on a glass of Pimms, is one of the most iconic Oxfordian activities. Punting is the English version of riding in a gondola, with the punter at the back of the seven-metre boat, rowing with a long pole that reaches the bottom of the river bed. The best punting can be found at Cherwell Boathouse, where hiring a punt for up to six people on a weekend will cost $34 per hour or $170 for a full day, and slightly less on weekdays. If you paddle far enough along the river you can stop at a riverside pub for a beverage, or to say hello to the cows grabbing a drink from the river bank. There are plenty of things to see in Oxford: just walking the street for one, or exploring the libraries and university buildings or shopping. The University of Oxford Botanic Gardens and Arboretum are a must-see when on a visit to Oxfordshire, and the perfect spot for a picnic lunch or to sit and read a book (how appropriate!). If you are looking for something spectacular to see, and happy to drive 30 minutes out of the town, Waddesdon Manor, built by Baron Ferdinand de Rothschild in the late 19th century, is a sight for sore eyes. Set on over 2000 hectares of mostly manicured gardens and forest, the residence boasts a French renaissance style and is home to the Rothschild Collections of paintings, sculpture and decorative arts. You can come and see how the other half lived as the manor house is now managed by the Rothschild Foundation on behalf of the National Trust and open to visitors. A country hamlet in Buckinghamshire, less than half an hour’s drive from Oxford, Poundon is the ultimate town for a romantic weekend away. Surrounded by flowing fields of farmland, old local pubs and humble English cottages, Poundon (and a number of surrounding hamlet towns) is an amazing escape from busy London town, offering the authentic country experience you’re looking for. An hour and a half by car, Poundon offers a unique country experience not too far from the city. For a fully immersive experience in an English country town, an old local pub can’t be beaten. With plenty in this area the choice is difficult. Perhaps you could be tempted by a roast at the Red Lion, a tiny pub just out of Poundon with a thatched roof and ceilings so traditionally low that you can scarcely stand up. With its white facade in the centre of Poundon, the Sow and Pigs dates back to the 1800s. Describing its own menu as ‘swine dining’, this pub will not disappoint. Try the chef’s crackling with apple sauce and the baked camembert with garlic and thyme for starters and the slow-cooked beef brisket for main. You also have the choice to create your own burger for £11.50 and an array of daily desserts to finish it all off. Book yourself into a bed and breakfast for a cosy and romantic stay. The charming and peaceful Manor Farm Bed and Breakfast – right in the centre of Poundon and with gorgeous countryside views – has three en suite guest rooms, a communal kitchen and elegant lounge room that invites playing board games and reading books (with many of each supplied). Breakfast is made fresh daily and consists of homemade bread and condiments, or yoghurt, fruit and local honey. Another great thing to do when in Poundon is to venture out to Bicester Village: a collection of factory outlets for upper-end brands. Here you’ll find Montblanc, Timberland, Cath Kidston and Gucci at a fraction of the retail price. The best thing to soak up in Poundon is the countryside. Take a walk around the narrow country lanes to relax, and even take a stroll past Poundon House, an Edwardian estate nothing short of breathtaking. Formerly the home of Jane Austen (and now home to the Jane Austen Centre), Bath is a cultural hub filled with history and atmosphere. With much to do and see in this gorgeous West Country city, any visitor to London must venture out and explore it, at least once. A two-hour drive or one and a half hours by train will get you from London’s city centre to Bath. If you enjoy a bit of spontaneity, and very fine cuisine, Menu Gordon Jones is the best place in Bath. The concept, created by the up and coming chef Gordon Jones, is that every meal is a surprise. At £50 for a five-course meal, you sit and wait patiently for whatever the chef decides to serve you. This is not only fine dining, but an experience that can only be had in Bath. Although this isn’t Cornwall, stop into the Cornish Bakery when in Bath for a pasty, scone and an excellent coffee. For a brilliant breakfast, stop in at Bill’s for a stack of buttermilk pancakes (and nab yourself a side of bacon too!). Bill’s, with a gorgeous deep green frontage, reminiscent of an English pub, is hard to miss – so don’t. Bath’s compact city centre can be easily enjoyed by foot, but for a sweeping overview of its majestic architecture and attractions – from the Royal Crescent to the Roman Baths and Bath Abbey – hop on an open-top city sightseeing bus. And for a little R&R after all that sightseeing, visit Thermae Bath Spa, where you can bathe in naturally warm, mineral-rich water, just as the Romans used to do. This spa retreat in the middle of the city is inspired by (you guessed it!) the Roman Baths. The Roman Baths, ancient religious spas situated right in the centre of the city, are a must see-in Bath (considering the city’s named after them). The baths, built in opulence, were public bathing houses that were filled using aqueducts and ancient heating systems, showcasing the sophistication of the Roman Empire. To make the most of your visit, book the ‘above and below’ tours, to see the site below and above ground. A county to the south-west of London, Cornwall is made up of many picturesque towns and villages, and is best explored with a car. From London, to the most westerly part of Cornwall (and indeed, England), Land’s End is a five-hour drive and almost seven hours by train. Wherever you are in Cornwall, make sure you’re eating clotted cream: on toast, on scones and even as ice-cream. Another delicacy is the Cornish pasty – a hand-held meat and vegetable pie originally developed as a lunch for Cornish tin miners in the 17th and 18th centuries. If you’re looking for something more than cream and pastry, the 13th-century Turks Head pub in Penzance, complete with underground smugglers’ tunnel, is fabulous for enjoying local beer and seafood. Head to the Eden Project, home to the largest indoor rainforest in the world. With a giant flying fox across the tops of the forest, this is not only an educational experience but also an exhilarating one. Visit Polperro, an ancient fishing village in Cornwall. With narrow winding streets, this small, unspoilt town feels like something out of a fairy tale. There is also a resident stray dog, who hangs with the fisherman who still shuck their oysters on the shore. Another noteworthy town in this gorgeous county, mostly unknown by tourists, is Charlestown. An untouched 18th century port town that used to be bustling with trade. The port, still completely intact, was used as a set for the first season of Poldark. It’s perfect for photographs, antique shopping and a bite to eat; try scones and English breakfast tea in the Pier House, an inn with accommodation that overlooks the town’s Georgian harbour. Penzance is another beautiful Cornish town. It boasts great shopping and friendly locals and amazing architecture that sparkles on a sunny day. Not far from the centre of the city is Saint Michael’s Mount, which can be ventured to via boat when the sea is not too choppy, or by foot when the tide is low. This mount, a small island just off the coast, is a civil parish and a Cornish Icon. A 20-minute drive from Penzance is Cornwall’s furthermost point and one of England’s most famous landmarks, Land’s End. Steeped in history and ancient legend, this clifftop destination affords views out of the Atlantic Ocean and more opportunities to indulge in some of the things that Cornwall does best – from pasties to clotted cream ice-cream. Another county south-west of London, Devon is home to exquisite country, coastal and riverside towns. With so much to do in Devon, a car is the best way to make sure you can get a taste of everything it has to offer. Approximately three hours by train, and a 3.5-hour drive from London to the centre of Devon. Whilst in Devon, and England for that matter, it would be a sin not to sit down to a Devonshire tea. With English breakfast tea and scones, act like an authentic Devonian. While Devonshire teas can be found at all good cafes and restaurants in Devon. I suggest heading to Exeter for the Hidden Treasure Tea Rooms cream tea. Additionally, The Strand tea rooms, in Plymouth, does the perfect cream tea situated in an old cobbled street location. Finally, the Cream Tea Café in Barnstaple is devoted to Devonshire cream tea and is a must-stop in when visiting this county. Why not visit Agatha Christie’s private holiday home, ‘Greenway’ in Brixham, and wander through the rooms where she wrote many of her books? Whether you’re a Christie fan or not, this experience is imperative on a trip through Devon. Another must-do in Devon is to hike through the Valley of the Rocks, spotting ancient rock formations, herds of goats and picturesque views of the ocean. Travel through Dartmoor via Dartmoor way, which follows a scenic route through the most beautiful villages and homesteads in the area.